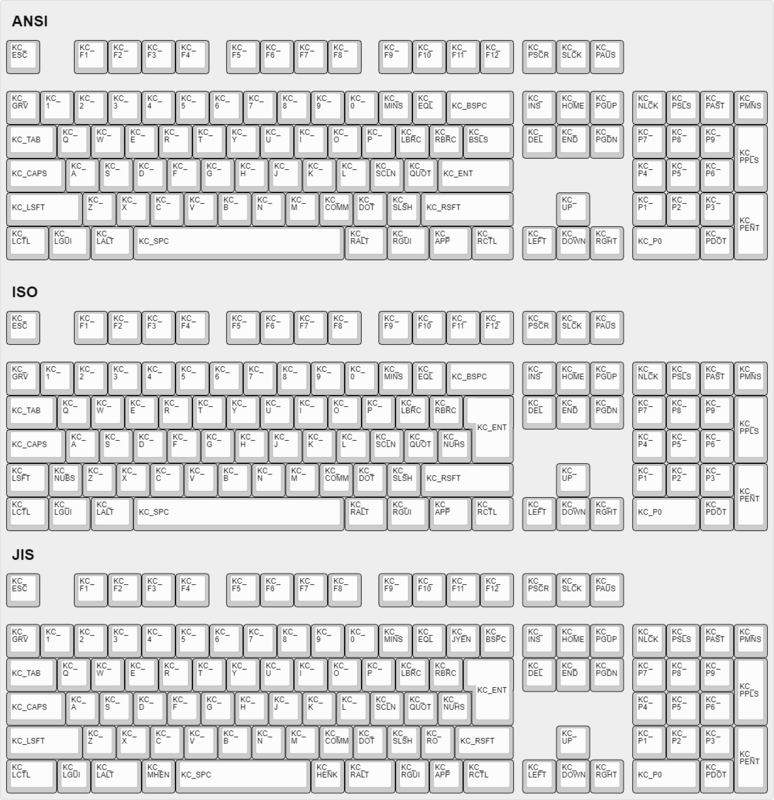 This page covers questions people often have about keymaps. If you haven't you should read Keymap Overview first. What Keycodes Can I Use? See Keycodes for an index of keycodes available to you. These link to more extensive documentation when available. Keycodes are actually defined in common/keycode.h. What Are the Default Keycodes? QMK has two features, Bootmagic and Command, which allow you to change the behavior of your keyboard on the fly. This includes, but is not limited to, swapping Ctrl/Caps, disabling Gui, swapping Alt/Gui, swapping Backspace/Backslash, disabling all keys, and other behavioral modifications. The key found on most modern keyboards that is located between KC_RGUI and KC_RCTL is actually called KC_APP. This is because when that key was invented there was already a key named MENU in the relevant standards, so MS chose to call that the APP key. Use keycode for Print Screen(KC_PSCREEN or KC_PSCR) instead of KC_SYSREQ. Key combination of 'Alt + Print Screen' is recognized as 'System request'. Somewhat confusingly, there are two "Power" keycodes in QMK: KC_POWER in the Keyboard/Keypad HID usage page, and KC_SYSTEM_POWER (or KC_PWR) in the Consumer page. The former is only recognized on macOS, while the latter, KC_SLEP and KC_WAKE are supported by all three major operating systems, so it is recommended to use those instead. Under Windows, these keys take effect immediately, however on macOS they must be held down until a dialog appears. Modifier keys or layers can be stuck unless layer switching is configured properly. For Modifier keys and layer actions you have to place KC_TRANS on same position of destination layer to unregister the modifier key or return to previous layer on release event. After enabling this feature use keycodes KC_LCAP, KC_LNUM and KC_LSCR in your keymap instead. Old vintage mechanical keyboards occasionally have lock switches but modern ones don't have. You don't need this feature in most case and just use keycodes KC_CAPS, KC_NLCK and KC_SLCK. NO UNIVERSAL METHOD TO INPUT THOSE WORKS OVER ALL SYSTEMS. You have to define MACRO in way specific to your OS or layout. See this post for example MACRO code. On Windows you can use AltGr key or Alt code. On Mac OS defines Option key combinations. On Xorg you can use compose key, instead. And see this for Unicode input. Unlike most Fn keys, the one on Apple keyboards actually has its own keycode... sort of. It takes the place of the sixth keycode in a basic 6KRO HID report -- so an Apple keyboard is in fact only 5KRO. It is technically possible to get QMK to send this key. However, doing so requires modification of the report format to add the state of the Fn key. Even worse, it is not recognized unless the keyboard's VID and PID match that of a real Apple keyboard. The legal issues that official QMK support for this feature may create mean it is unlikely to happen. See this issue for detailed information. Keys Supported in Mac OSX? You can know which keycodes are supported in OSX from this source code. usb_2_adb_keymap array maps Keyboard/Keypad Page usages to ADB scancodes(OSX internal keycodes). And IOHIDConsumer::dispatchConsumerEvent handles Consumer page usages. Japanese JIS keyboard specific keys like 無変換(Muhenkan), 変換(Henkan), ひらがな(hiragana) are not recognized on OSX. You can use Seil to enable those keys, try following options. See the Grave Escape feature. This turns right modifier keys into arrow keys when the keys are tapped while still modifiers when the keys are hold. In TMK the dual-role function is dubbed TAP. KC_EJCT keycode works on OSX. https://github.com/tmk/tmk_keyboard/issues/250 It seems Windows 10 ignores the code and Linux/Xorg recognizes but has no mapping by default. Not sure what keycode Eject is on genuine Apple keyboard actually. HHKB uses F20 for Eject key(Fn+f) on Mac mode but this is not same as Apple Eject keycode probably. real_mods is intended to retains state of real/physical modifier key state, while weak_mods retains state of virtual or temporary modifiers which should not affect state real modifier key. real_mods still keeps modifier state. here real_mods lost state for 'physical left shift'.